The patrols serve as a rare example of limited collaboration between the two sides in the maritime realm. Last week, China and Vietnam held another iteration of a joint patrol around the Gulf of Tonkin. The patrol spotlighted an ongoing activity that both sides have continued to develop in spite of the lingering differences they have, including in the maritime realm. Vietnam and China have long managed a relationship that has been fraught with challenges even amid the opportunities it offers. China occupied Vietnam for nearly a millennia, the two countries have fought multiple wars, and even today, Hanoi continues to feel the occasional effects of Chinese coercive power, including in the South China Sea. One of the examples where both sides have managed to collaborate in a limited away even amid these challenges is the joint patrols in the Gulf of Tonkin. Following protracted negotiations, both sides arrived at a landmark agreement in 2000 to delimit part of the Gulf of Tonkin as well as a fishery arrangement in the area, and they subsequently began joint patrols back in 2006. The joint patrols have been cast by both sides as an opportunity for them to accomplish common objectives, which include preserving security in the area, educating fishermen on the laws of both countries, and discussing specific areas of management. While the patrols have in fact evolved at a much slower pace than intended and they have not prevented incidents or clashes between the two sides, they have nonetheless gradually expanded over time across different metrics, including distance covered. They typically involve a mix of talks between the two sides, checks on fishing boats in the area in shared fishing grounds, and the practicing of certain drills. Last week, both sides held the second such Vietnam-China joint fisheries patrol in 2018, following the first round that occurred in April. The respective delegations were headed by Nguyen Van Tho, deputy commander and chief of staff of Vietnam’s Coast Guard Region 1 Command, and Liu Tianrong, deputy chief of the Nanhai Division of the Chinese Coast Guard. 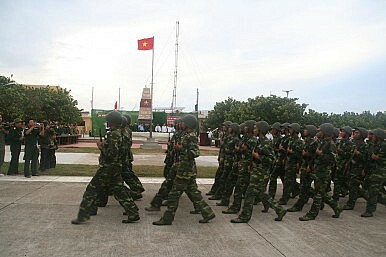 According to Vietnam’s defense ministry, the joint fishery patrol was carried out from seamark No. 1 to 11 along the demarcation line of the Gulf of Tonkin. During the patrol, both coast guards inspected fishing boats in the area – around 122 Vietnamese and 108 Chinese fishing boats were operating in the shared fishing grounds at the time – and conducted other activities such as delivering educational booklets and other materials to fishermen as a way to encourage them to follow the fishery cooperation agreement in the Gulf of Tonkin signed by their governments. The Vietnamese statement characteristically noted that the fishery patrols created a peaceful and stable environment and provided a good opportunity for coast guard forces to exchange experiences. In reality, the patrols serve as one of the few examples in the maritime realm where Vietnam and China have been able to carve out some space for collaboration amid continued contestation. Incident is a warning that despite attempts to downplay the flashpoint, tensions could quickly escalate.